Although the Salesforce Apex limits, or governors, are designed to ensure that runaway Apex code or processes don’t monopolize shared resources, it's not a rare case, when exceeding such limits causes the development issues. 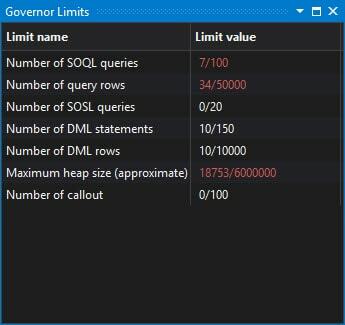 The Welkin Suite offers you a handy way to track reaching limits during debugging your code. This option is available via the Governor limits window in the Debug mode. 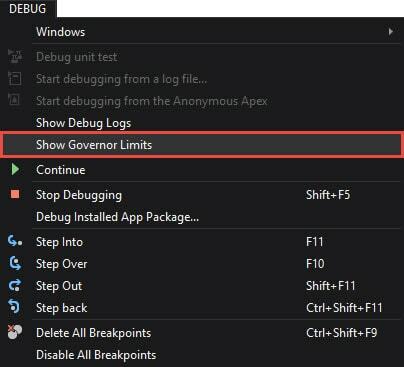 To open this window, in the Debug mode of The Welkin Suite, navigate to the Main Menu: Debug ⇒ Show Governor limits. Limit value — reached and allowed. Number of callouts as well as most previous items is calculated by the number of CALLOUT_REQUEST items in the Debug Log file. By default, all of the maximal values are related to the synchronous limits, and if you step into the asynchronous context, they can be changed in-line to the corresponding values. Data in the 'Limit value' column changes dynamically during the execution flow. Once a step raises the value of reached limits, this information is highlighted in a red color. Thanks to this, you can trace, which limits were reached and their values, at every single line of execution flow.